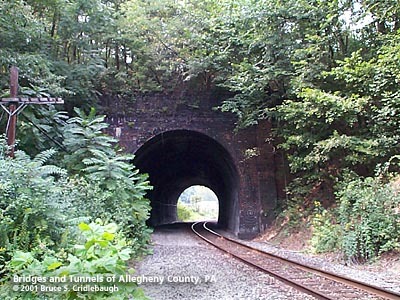 The tunnel at Spencer Lane in Glenshaw does not include the details of the name and date as are found on the Etna Tunnel to the south. The stone on the portal of the Etna Tunnel notes the date as 1903. The 1876 atlas shows the Etna tunnel under construction -- indicating they were rebuilt, probably enlarged.